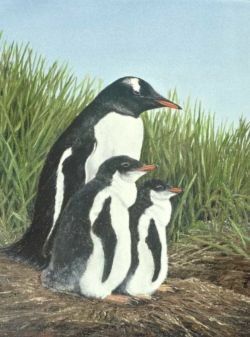 Gentoo Twins by artist Mike Skidmore. 18" x 14", Oil on Canvas, 1994 Artist and illustrator Mike Skidmore has donated this endearing painting to South Georgia Heritage Trust. 100% of the sale will be used to benefit South Georgia. Artist and illustrator Mike Skidmore has donated this endearing painting to South Georgia Heritage Trust. 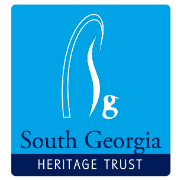 100% of the of the funds raised by its sale will be used to benefit South Georgia.